After spending 12 years in America, Rich Hackman ’08 considered himself more American than African and even less so, Ghanaian. Born in Ghana, Hackman and his family left when he was two years old. He’s lived in Czechoslovakia, New York, California, New Jersey, and of course, Reading, Pa. In July 2009, the artist was faced with a difficult decision. His student visa had expired and his father’s health was poor. He had to return to his birthplace of Accra, the capital city of Ghana. It’s a place where, “vibrant colors and seductive sounds fill the streets…,” Hackman says. As a child, he had been back three times over the years. But moving there as an adult was different. He had to learn to adapt to the frequent electricity and water shortages, the lack of reliable Internet and not knowing many people. Hackman decided to stay. 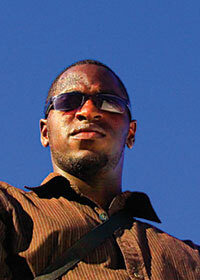 However, as a freelance graphic/web designer, finding work in Ghana was difficult too. Job searching in Ghana is about who you know. Although he didn’t know anyone, he eventually got a job working as a graphic/web designer and junior web developer for Explainer DC, a Dutch-affiliate company based in Ghana. But for Hackman, his job at Explainer DC simply paid the bills. Mixing the experience he gained at this job, his passion for the arts and his global experiences, Hackman created his own web site, Studio Creatif, a design, arts and entertainment site for artists interested in satisfying their need for creativity. The web site hosts a team of visual and performing artists, including Albright alumni and faculty. It’s a means to work with businesses or individuals on any creative project or venture. And, it’s an outlet for Hackman’s true passion—art. While his global experiences have influenced his art, the western experiences he’s had have played a much larger role, in that his art follows the rules of form and function. “From the rigidity of New York City, to the laxity of California… also the mysticism imbued in the portrayal of the African continent, there is so much material that I am inspired by,” says Hackman. His passion for art is the reason Albright’s first student arts magazine,Albright A.M., exists. Created in 2007, Hackman’s junior year, the newsletter covers music, theatre, art and film events both on and off campus. It’s almost been a year since Hackman moved back to Ghana. While the move was unavoidable and laced with challenges, it’s also been exciting as he’s been able to fulfill his artistic sensibilities and reconnect with his birthplace. “At the root of it there was something so familiar, so uncompromisingly welcoming: the culture, the food, the people, it all came back to me,” he says. To check out Studio Creatif, go to www.richhackman.com.